I highly recommend to home buyers to visit the homes you like in person. While the ability to see photos of your new potential home on the internet is convenient, remember this – a picture may say a thousand words, but you will never have a true representation of the home and all it has to offer if you end your search online. Photography has come a long way. While the intention is never to deceive a home buyer, let’s face it when a home is professionally photographed and edited, the flaws will be absent. A well photographed listing is meant to highlight the home’s features and draw in buyers. Peaking your interest is at the top of a seller’s mindset when preparing a home for sale. 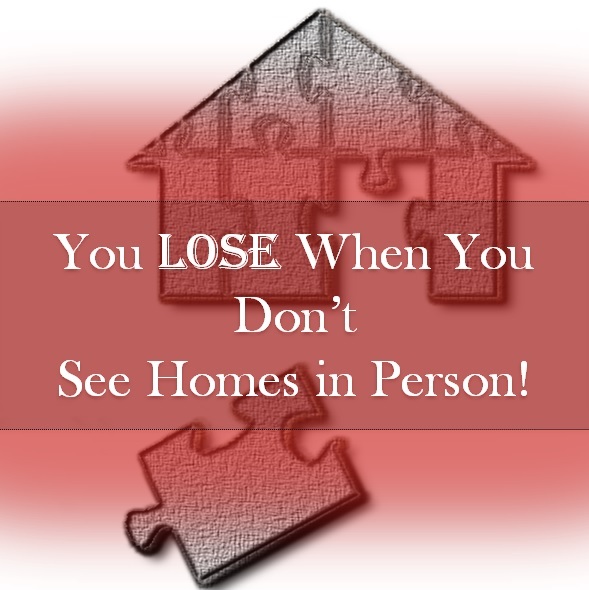 Visiting the home in person will ensure you are able to see both the pro’s and con’s of the home. Another point to consider, as Andrew Fortune discusses in his article on viewing homes online versus in person, you are not able to see the true size of the rooms in the home. Generally speaking, a room will appear larger online than in person, especially if a wide-angle lens was used. Let’s talk short sales for a moment. If you’re a buyer purchasing a short sale, you should always be sure to view the home in person, as photos of short sale homes will most likely not be a true representation of the homes current condition. There are many things to consider when choosing a neighborhood (via Bill Gassett), things you won’t know by looking at photos online. Yes, you can do neighborhood research on line to gather information about schools, what’s in walking distance and the like, but to visit the home and walk and/or drive around the area is most important. Another home buyer tip is to drive around a potential neighborhood during different times of the day to get a feel for the traffic, construction zones, and potential safety hazards. The bottom line here is that home buyers should find a good Realtor and see the home’s interior. Real estate investment mistakes are costly!